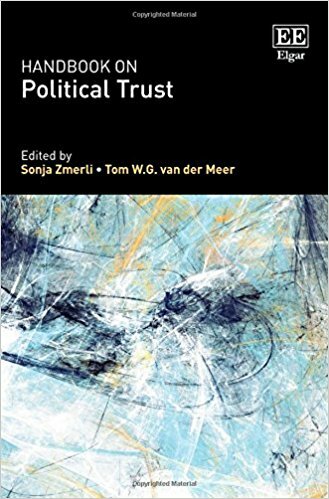 In Handbook on Political Trust, edited by Sonja Zmerli and Tom W G van der Meer, an international body of 41 experts offers an excellent overview of the scholarly literature on political trust, complemented by original empirical research and analysis. Across the chapters, the authors pinpoint gaps in the literature and identify new venues for research, making this handbook a valuable reference book, tool and guide for advanced students of political science, finds Nazrin Mehdiyeva. Handbook on Political Trust. Sonja Zmerli and Tom W.G. van der Meer (eds). Edward Elgar Publishing. 2017. Declining trust in government has spread across advanced industrial democracies since the 1970s, leading to concerns among political scientists that this could pose a survival risk for representative democracies by eroding trust in their democratic norms and institutions. It has also been feared that lack of trust will translate into lack of action, and that this inability to ‘get things done’ will gradually result in the loss of popular support for features of a democratic society, such as freedom of the press and free markets (376). Masterfully presented and discussed across the 500-page Handbook on Political Trust, timely analyses of these and other concerns shed light on the bigger question which is not explicitly discussed in the book but which is being increasingly raised in political, academic and public policy circles: are we witnessing the demise of the West? And if so, is this at least in part related to declining trust in the political system and in democracy generally? This volume counts 41 contributors and is divided into three parts. Part One systematically examines theoretical and methodological approaches to political trust. Part Two looks at the causes, correlates and consequences of political trust, analysing a wealth of issues from individual-level biological and psychological factors that influence political trust to macro-level elements, such as immigration, corruption, inequality and the mass media. In Part Three, the authors examine how the earlier explanations relate to regions across the globe. In Chapter 23, Russell J. Dalton observes that neither the end of the Cold War, in which the democratic West prevailed over the authoritarian Soviet Union, nor the economic gains of the 1990s reversed the trend of declining political trust (375). But the editors cite findings from recent literature which illuminate that, although strong dissatisfaction with government performance has become entrenched, this has co-existed with strong support for democratic institutions (6-7). Lower levels of trust have not (so far) led to the collapse of democracy or challenges to democratic norms and institutions. Rather, economic development and social modernisation in advanced industrial democracies have encouraged new types of engaged, questioning and assertive publics, for whom strong economic performance no longer automatically leads to increased trust. A ‘new civic culture’ has emerged: as Dalton astutely puts it, this culture is ‘fundamentally different from the cultural model of the past’ (391). Now, dissatisfied citizens are the ones supporting democratic ideals and seeking to strengthen democracy. My understanding of the arguments made by a number of the contributors is that in advanced industrial democracies, positive economic growth does not necessarily increase political trust, but negative economic growth and prolonged economic crises, such as that of 2007-08, accelerate the decline (522, 436). This is not so in authoritarian settings such as China, where there appears a close positive relationship between economic success and political trust (58-59). This dynamic is likely to be susceptible to future change as better standards of living could lead a larger and wealthier middle class to start questioning political trust in central government. The level of economic development therefore appears of immediate relevance when assessing the factors influencing trust and satisfaction in government. The authors consistently demonstrate that in Latin America, sub-Saharan Africa and the Arab world, low political trust is linked to the states’ inability to provide public goods, external security and so forth (461-87). In their chapter on political trust in authoritarian settings, Paola Rivetti and Francesco Cavatorta find that in authoritarian regimes, high political trust in state institutions ‘can exist and even thrive’ without political accountability and where state power is exercised in an arbitrary manner (65). Yet research from the politically diverse Asia-Pacific region, presented by Chong-Min Park in Chapter 28, concludes that rule of law constitutes a significant source of trust in democratic and authoritarian contexts alike (505). Rule of law is a hallmark of good governance and, as the last chapter posits, to ‘cure democracy’ (as far as perceptions are concerned), governments would be better served by improving the quality of governance rather than introducing ‘more democracy’ (523). This conclusion makes a strong case in favour of governments emphasising impartiality and procedural fairness over higher GDP per capita if they seek to achieve more positive evaluations of democracy. Beliefs are highly relevant to political trust, and their influence is discussed throughout. The most notable is the chapter in which Lauren McLaren outlines how diversity resulting from immigration may negatively influence perceptions of national political systems. McLaren argues that far-right mobilisation and histories of experiences with immigration are the two key contexts shaping the relationship between immigration concerns and (dis)trust in political systems (320). Importantly, she also looks at the trust levels of immigrants towards their adoptive regimes and how this changes with generations. The chapter is a must-read in the light of key contemporary events, notably the inflow of migrants and refugees into Europe, the role of immigration concerns in the UK ‘Brexit’ vote and the politicisation of the issue by the far-right presidential candidate Marine Le Pen in the 2017 French elections. The importance of beliefs is also tackled through discussion of the role of mass media in influencing public trust. Ken Newton highlights how the assumption frequently made about the power of mass media is not easy to reconcile with the empirical evidence of experimental social psychology research which demonstrates that people with strong beliefs and values often remain unpersuaded even in the face of overwhelming evidence to the contrary. This leads Newton to suggest that the role of the media in influencing political trust may be exaggerated. Research presented in Chapter 26 on Central and Eastern Europe deserves a mention here as Gergõ Závecz concludes that post-communist states suffer from political distrust, which has much to do with past experience, a historical lack of trust in government and institutions and fears of failure (456). The unprecedentedly arduous ‘triple transition’ that these states had to endure when shifting simultaneously to democracy, market economy and full statehood also contributed to public expectations of failure and low political trust (440). To truly do justice to this handbook, it would be necessary to go through every chapter individually as each has many insights to offer. For instance, research into biological factors, such as individuals’ genetic predisposition to trust (or not) other people, has a rightful place in this collection. That the contributors also pinpoint gaps in literature and identify new avenues for research makes this book a godsend to aspiring doctoral students of political science. What is nonetheless missing is a dedicated chapter on the link between foreign policy and political trust. There is a fleeting observation in the book that knowledge may not be needed for higher trust: for instance, research into US politics suggests that, despite having less information on foreign policy, Americans have more trust in their government’s conduct of foreign than domestic affairs (164). There is also a brief discussion of the relationship between a country’s security environment and political trust in Chapter 27 on sub-Saharan Africa and the Arab region. But much remains to be said on the relationship between high-profile (and publicly well-known) foreign policy decisions made by a democratic state, such as the US invasion of Iraq, and political trust. Whether major foreign policy decisions taken against the will of the many undermine political trust in individual governments or in democratic institutions at large needs to be examined. Furthermore, probing the levels of trust that foreign nationals have in democracies and in the West’s ability to lead the changing world order could also be a worthy endeavour. People around the world who believe in the supremacy of democratic ideals contribute to sustaining Western leadership in the existing liberal international order. This order is being increasingly challenged by the rising powers, such as China and Russia, which promote a different model of economic and political development. It is a fundamental belief underlying this handbook that political trust is essential for creating and maintaining a democratic order. But do positive international attitudes towards democracy contribute to sustaining the West’s position in the global order? Until more empirical research is conducted, we may be forgiven for indulging in some wishful thinking and believing that, despite the current shortage of inspirational leadership in the West, trust in democratic principles and values that transcend national boundaries will remain strong and shared by a large number of ordinary people across the world. It is this fundamental trust that could provide a new impetus to Western leadership and prove to be a powerful source of democratisation in the long run. Dr Nazrin Mehdiyeva is a specialist in energy security and geopolitics, advising international majors and governments. She holds a D.Phil. in International Relations from University of Oxford. Nazrin has authored and contributed to a number of academic and industry publications. Her book Power Games in the Caucasus was published by I.B. Tauris in 2011. Read more by Nazrin Mehdiyeva. One of the things that is not much looked at is the impact of this lack of trust on voters’ behaviour, and how they respond to perceived betrayal. In the USA an outsider is elected as president (with all the consequences – endless division and disaffection, with the old political class leading the charge to destabilise the boat), and in France, more cleverly, someone dressed up by the political class as a supposed outsider is elected (all others by mid 2017 would probably fail to beat off the Front National challenge). In Greece the leftwing outsider Syriza was elected from nowhere and even won a referendum against austerity…and promptly sold out to effectively become one of the most rightwing governments in Europe under the intense pressure from Germany and the EU. They key here is how are these countries’ voters responding? Above all to betrayals by these new people’s champions. It is a bit too early to tell with Trump, but Macron appears to have been rumbled already and is in for a torrid time. Greece has a few years of this perceived betrayal under its belt. And an awkward point if you look at what is widely by all voters perceived to be the Greek betrayal is that although the main opposition is now back leading in polls, among young voters the extremist Golden Dawn is frequently now the number 1 choice. The same now applies in France, where old voters stick doggedly and hopefully to the ‘main’ parties, swinging back and forth with every perceived betrayal, but newer and younger voters are moving towards what they see as the only option, something outside of the norm, and it is pretty solidly Front National in polling of the young. If this is indeed a process, then it should worry – a discredited and disliked political elite is shunned by the voter, new devices have to be introduced to keep them from mass abstention or riot or voting for outsiders, so novel, ‘breath of fresh air’ parties and celebrity candidates appear…and then fail to deliver after a short time in office as in Greece, and just appear to merge in as part of the elite…and what follows next could be very dangerous.